O Lord, God of our Fathers, who bestowed on Saints Joachim and Anne this grace, that of them should be born the Mother of your incarnate Son, grant, through the prayers of both, that we may attain the salvation you have promised to your people. Through our Lord Jesus Christ, your Son, who lives and reigns with you in the unity of the Holy Spirit, one God, for ever and ever. It was in the home of Joachim and Ann where the Virgin Mary received her training to be the Mother of God. Thus, devotion to Ann and Joachim is an extension of the affection Christians have always professed toward our Blessed Mother. We, too, owe a debt of gratitude to our parents for their help in our Christian formation. According to the 1962 Missal of St. John XXIII the Extraordinary Form of the Roman Rite, today is the feast of St. Ann; St. Joachim's feast in this rite is celebrated on August 16.
Who does not know about the great shrine of Ste. Anne de Beaupre in Canada, where miracles abound, where cured cripples leave their crutches, and where people come from thousands of miles to pray to the grandmother of Jesus? At one time, July 26 was the feast of St. Anne only, but with the new calendar the two feasts of the parents of the Blessed Virgin Mary have been joined and are celebrated today. Our information about Mary's parents comes from an apocryphal Christian writing, the Protoevangelium Jacobi (or Gospel of James), written about the year 170. According to this story, Joachim was a prominent and respected man who had no children, and he and his wife, Anne, looked upon this as a punishment from God. In answer to their prayers, Mary was born and was dedicated to God at a very early age. From this early Christian writing have come several of the feast days of Mary, particularly the Immaculate Conception, the Nativity of Mary, and her Assumption into Heaven. Very early also came feast days in honor of SS. Joachim and Anne, and in the Middle Ages numerous churches, chapels, and confraternities were dedicated to St. Anne. The couple early became models of Christian marriage, and their meeting at the Golden Gate in Jerusalem has been a favorite subject of Christian artists. Anne is often shown in paintings with Jesus and Mary and is considered a subject that attracts attention, since Anne is the grandmother of Jesus. Her two great shrines — that of Ste. Anne d'Auray in Britanny, France, and that of Ste. Anne de Beaupre near Quebec in Canada — are very popular. We know little else about the lives of Mary's parents, but considering the person of Mary, they must have been two very remarkable people to have been given such a daughter and to have played so important a part in the work of the Redemption. There is a church of St. Anne in Jerusalem and it is believed to be built on the site of the home of SS. 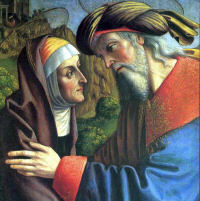 Joachim and Anne, when they lived in Jerusalem. On Easter AD 792, Charlemagne discovered the relics of Saint Anne with the help of a deaf handicapped boy. It’s a wonderful tale for this feast day of Saint Anne. Below is the account, preserved in the correspondence of Pope Saint Leo III, concerning the mysterious discovery of the relics of Saint Anne in the presence of the Emperor Charlemagne. Fourteen years after Our Lord’s death, Saint Mary Magdalen, Saint Martha, Saint Lazarus, and the others of the little band of Christians who were piled into a boat without sails or oars and pushed out to sea to perish — in the persecution of the Christians by the Jews of Jerusalem — were careful to carry with them the tenderly loved body of Our Lady’s mother. They feared lest it be profaned in the destruction, which Jesus had told them was to come upon Jerusalem. When, by the power of God, their boat survived and finally drifted to the shores of France, the little company of saints buried Saint Anne’s body in a cave, in a place called Apt, in the south of France. The church, which was later built over the spot, fell into decay because of wars and religious persecutions, and as the centuries passed, the place of Saint Anne’s tomb was forgotten. The long years of peace, which Charlemagne’s wise rule gave to southern France, enabled the people to build a magnificent new church on the site of the old chapel at Apt. Extraordinary and painstaking labor went into the building of the great structure, and when the day of its consecration arrived [Easter Sunday, 792 A.D.], the beloved Charlemagne, little suspecting what was in store for him, declared himself happy indeed to have journeyed so many miles to be present for the holy occasion. At the most solemn part of the ceremonies, a boy of fourteen, blind, deaf and dumb from birth — and usually quiet and impassive — to the amazement of those who knew him, completely distracted the attention of the entire congregation by becoming suddenly tremendously excited. He rose from his seat, walked up the aisle to the altar steps, and to the consternation of the whole church, struck his stick resoundingly again and again upon a single step. His embarrassed family tried to lead him out, but he would not budge. He continued frantically to pound the step, straining with his poor muted senses to impart a knowledge sealed hopelessly within him. The eyes of the people turned upon the emperor, and he, apparently in spired by God, took the matter into his own hands. He called for workmen to remove the steps. A subterranean passage was revealed directly below the spot, which the boy’s stick had indicated. Into this pas sage the blind lad jumped, to be followed by the emperor, the priests, and the workmen. They made their way in the dim light of candles, and when, farther along the pas sage, they came upon a wall that blocked further advance, the boy signed that this also should be removed. When the wall fell, there was brought to view still another long, dark corridor. At the end of this, the searchers found a crypt, upon which, to their profound wonderment, a vigil lamp, alight and burning in a little walled recess, cast a heavenly radiance. As Charlemagne and his afflicted small guide, with their companions, stood be fore the lamp, its light went out. And at the same moment, the boy, blind and deaf and dumb from birth, felt sight and hearing and speech flood into his young eyes, his ears, and his tongue. “It is she! It is she!” he cried out. The great emperor, not knowing what he meant, nevertheless repeated the words after him. The call was taken up by the crowds in the church above, as the people sank to their knees, bowed in the realization of the presence of something celestial and holy. The crypt at last was opened, and a casket was found within it. In the casket was a winding sheet, and in the sheet were relics, and upon the relics was an inscription that read, “Here lies the body of Saint Anne, mother of the glorious Virgin Mary.” The winding sheet, it was noted, was of eastern design and texture. Charlemagne, overwhelmed, venerated with profound gratitude the relics of the mother of Heaven’s Queen. He remained a long time in prayer. The priests and the people, awed by the graces given them in such abundance and by the choice of their countryside for such a heavenly manifestation, for three days spoke but rarely, and then in whispers. The emperor had an exact and detailed account of the miraculous finding drawn up by a notary and sent to Pope Saint Leo III, with an accompanying letter from himself. These documents and the pope’s reply are preserved to this day. Many papal bulls have attested, over and over again, to the genuineness of Saint Anne’s relics at Apt. Anne: against poverty; barren; broommakers; cabinetmakers; carpenters; childless couples; equestrians; grandmothers; grandparents; homemakers; housewives; lace makers; lace workers; lost articles; miners; mothers; old-clothes dealers; pregnancy; pregnant women; horse riders; seamstresses; stablemen; sterility; turners; women in labour; Brittany; Canada; France; Quebec; archdiocese of Detroit, Michigan; diocese of Norwich, Connecticut; Santa Ana Indian Pueblo; Taos, New Mexico. Anne: Book, symbol of her careful instruction of Mary; flowering rod; crown; nest of young birds; door; Golden Gate of Jerusalem; book; infant Virgin in crib; Shield has silver border masoned in black, with silver lily on a blue field referring to the girlhood of the Virgin. Often Portrayed As: Woman holding Mary or Jesus in her arms or lap; Woman at her betrothal to Joachim; Mother teaching Mary to read the Bible; Woman greeting Saint Joachim at Golden Gate; Woman with a book in her hand. Joachim: Basket containing doves; model of Golden Gate of Jerusalem. Often Portrayed As: Man bringing a lamb to the altar and being turned away by the priest; greeting and/or kissing Saint Anne at the Golden Gate; elderly man carrying a basket of doves and a staff; elderly man with the child Mary. See more about the Shrine of Sainte Anne de Beaupré in Quebec, Canada. Several relics of St. Anne are also located in this shrine. Take a video tour of the Shrine here accompanied by beautiful Gregorian chant. Foods related to St. Ann and Joachim: It seems shellfish, particularly lobster, is one traditional type of food served in France for this feastday. See the suggested recipes in the left column. This feast falls right in the middle of summer season, so keep in mind the variety of wonderful summer fruits and make something special with them, particularly fruit pies or tarts. A Continual Feast: A Cookbook to Celebrate the Joys of Family and Faith Throughout the Christian Year mentions that "[i]n both France and French Canada what would commonly be served on this occasion is a fruit tart: such exquisite desserts are traditional at all patronal festivals (as well as other special occasions), especially those falling in the summer, when such a luscious assortment of fruits is available." She includes two recipes, plum tart and apple tart. From Ignatius Press another cookbook called Cooking With the Saints includes recipes for St. Anne's Cream (Crème Sainte-Anne) and Anna Torte (Gateau Sainte-Anne). One could also try to find "Bible foods" that St. Anne or the Blessed Virgin Mary would have cooked in their time. (But usually those aren't very festive!) This site gives some ideas on Biblical foods. As Joachim and Ann are the grandparents of Jesus, today has traditionally been a day to honor one's grandparents.